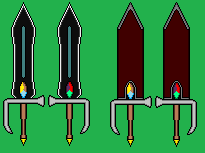 A pair of dueling-daggers for a fighter-witch. Kinda based the thoughts off of the fighter-swords that Ashton Anchors from Star Ocean: The Second Story uses. I am still making stuff, some of which has been going really slowly due to issues and some that are still needing refinement before I drop them here. 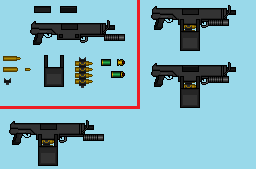 Went back and revisited a fusion-weapon idea, decided that the blaster-portion could use a bit of refinement, so the idea of a machine-pistol style body came to mind. Been a bit rough these past couple of weeks, but I did get a larger project out of the way. 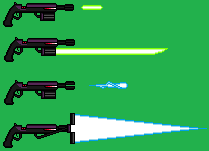 A friend of mine wanted some custom blasters for her characters, so I obliged and went at these ideas for her. If you're curious to know more, I can provide details as needed. Also, as an added bonus, I had to redo the last one, but I liked the design before the redo, so I kept that and here is that version as well. Taking a bit longer since work has been keeping me really busy, but here's a couple of things I've managed to get done. The idea of this was something for robotic/fully-mechanical characters for replenishing their liquid-energy supplies. The first one was a homage to the E-Tanks from Capcom's Mega Man, just done up more like energy-drink cans. The brand that this is called is "Charged". The second one is more towards a refillable container for the "Charged" drink, even with an indicator to show how much is left inside. Another design for a friend of mine, a single-chamber Mana Pistol with no requirement for outside energy to be used as each of the shells act like batteries in this one. I was going to add an embellishment or some sort of paint-job to it, but my friend did not get back with me on what sort of icon or design he'd want on the pistol. As for that yellow shot in the bottom left, that is a longer-range stun shot similar to a taser shock, not having any elemental affinity to it. ever hear of a caster gun? 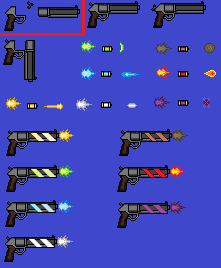 Yes I have, and most shells of a Caster are single-use only while Mana Firearms (self-powered or standard) are near-unlimited in shots that can be used (factors limiting this would be: the person's own energy if standard or the gun's power-supply if self-powered, the condition of the Mana filter gemstone "bullet", and the condition of the gun itself). 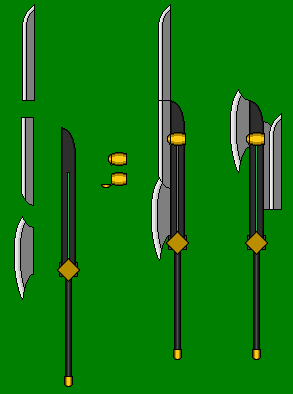 I have thought about making a sword variant, but figuring out the element-change setups might take a bit. Prototypes usually only hold one element at a time, but upgraded versions would have to be able to switch between multiple elements. Well my psionic sword idea usually used the energy within a being to form a blade I suppose a powerful enough battery like device would work, the fail safe might be a problem though, the user has to have a grip on the sword hilt for the energy to stay in the sword otherwise because of the fail safe the energy just leaves. Had to update the link for the pistol, but here's something else to add to it. 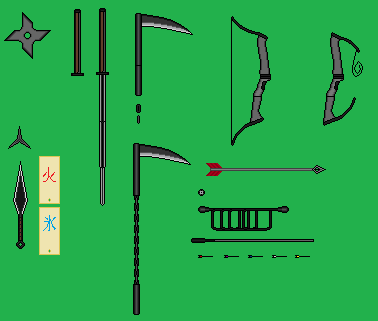 I wanted to make a custom weapon for a character belonging to a friend of mine, but the basic barbarian-type usually is hard to make something truly-custom for. 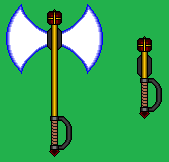 Monster Hunter's weapons actually had some good ideas, but I felt that even they lacked the right feel as well, so I combined the switch-axe idea with King Dedede's Jet Hammer for a bit of some extra oomph to the swing. 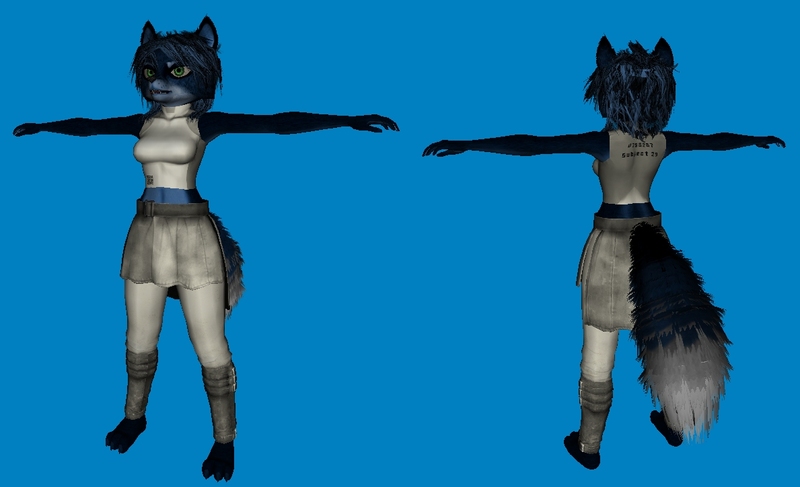 Tried a few things to work on for a friend of mine, which oddly enough the most-simple out of all of them was kept. And here's the one kept, a standard Colt-style revolver with removable revolving-chamber. This one was a bit interesting to make, but I was trying to make a revolver-hunting-knife mix (that didn't pan-out so I kept it as-is), but I did make a revolver-club. And decided to try my hand at the Morning Star version of the Vampire Killer from the Castlevania animated series. This one took a bit longer than I liked, but mostly I'd been at a standstill for sprite ideas. Reusing some pieces here and there though for a good portion of this. While burnout and lack of inspiration/motivation are still kicking my rear, I do have something made. I'll let you all guess the ship-designs these are based from. Don't think too hard on the paint-jobs for two of them, they're not canon to those ships. This one is my own concept of a fictional character's firearm, but I'll leave it up to you all to guess who it belongs to. This one is a weapon I designed for a friend of mine, giving a bit of a royal feel to it since it's also a scepter. battlestar galatica, F-zero, star wars.... i dunno...but the red one does give me a hint of a colonial viper vibe... and the green one sorta looks like a modified luke's landspeeder. Well, right about two of them. The red and the yellow ones are the original and reboot Colonial Viper shapes respectively. The green and the silver ones are the Japanese and the US box-art versions of the SolarStriker spacecraft respectively.